We love Le Binchotan for many reasons—it’s central location, cosy bar atmosphere and of course the delicious binchotan grilled dishes that chef Jeremy Chiam and his team serves up. And to satisfy our late night cravings, till the end of August ’18, to celebrate National Day, Le Binchotan is serving up supper inspired by local hawker delights. Once 6.00pm hits, you can hit the bar first and try out head bartender Gwendolyn Wong’s creation the Bubur Cha Cha Cocktail ($16++). 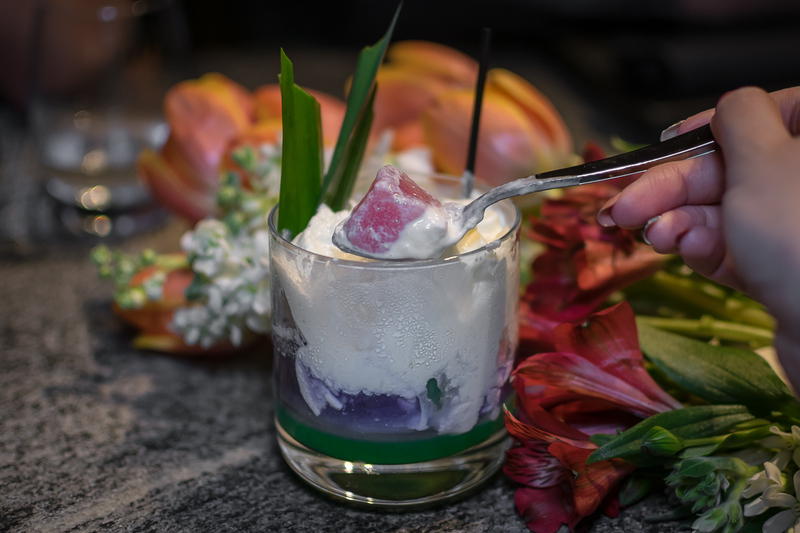 With a base of taro infused vodka and coconut & pandan syrup, this is definitely one for the sweet-tooths like me. Taking after the dessert, the most fun part is to forage for the colourful, chewy tapioca jelly chunks in the cocktail. Hang around (maybe have some dinner? ), then when 9.30pm rolls around—try out Le Binchotan’s 2 National Day supper dishes. 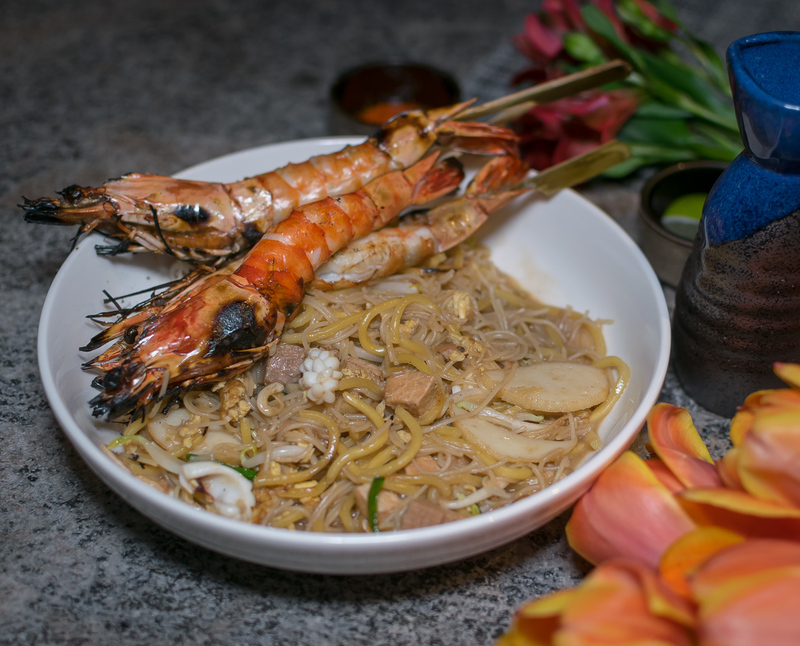 The Hokkien Mee with Binchotan-Grilled Tiger Prawns ($18++) is a comforting dish with a prawn base incorporating French cooking techniques. Prawn shells are roasted then simmered with mirepoix. Japanese scallops, bacon & pork belly are added to the stock for that extra flavour kick making this one slurp-worthy dish. As the broth is served separately, you get to control how ‘wet’ you like your noodles. If you like things a little spicy, you have to try the sambal belachan made in-house. And have you seen the size of those tiger prawns! The second supper dish is this Iberico Pork Collar Satay ($17++) which impressed me with it’s tenderness. 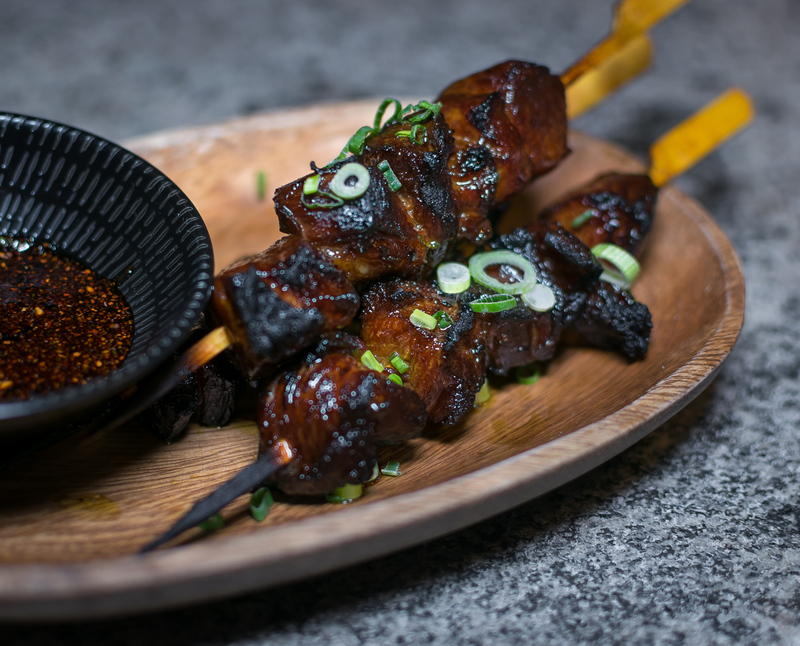 Inspired by Hainanese/Chinese-style satay, pieces of meat and fats are alternated on the skewer then grilled to smokey, charred perfection. Served with Kicap Manis sauce infused with shishito, banana shallots and togarashi—the ‘satay’ is flavourful enough to eat on it’s own, but the sauce will give it a little more sweetness. The fat to meat ratio was just right so it hardly felt sinful to have bite after bite of this smokey, sweet supper dish and it’s so good that we devoured multiple plates of this.